A new electronic cigarette (e-cigarette) is on the market and is becoming very popular with young people in the United States. The number of students using JUUL in schools is increasing and raises important health concerns for young people. Get the facts on how JUUL could affect your children and their health. JUUL is a new brand of e-cigarette. It is small, sleek, and looks a lot like a USB flash drive. It might be hard to identify since it does not look like most traditional e-cigarettes. 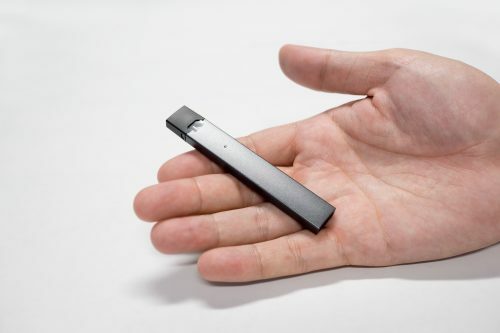 The JUUL’s small size makes it easy to hide in the palm of your hand which makes it even easier to hide from parents and teachers. JUUL has become more common at schools where students can easily share the device with each other in bathrooms or classrooms. Unfortunately, most JUUL users are not aware that this product contains nicotine which can be very dangerous to a child’s health. One JUUL pod is almost equal to a pack of cigarettes or 200 cigarette puffs. It can give the user a high dose of nicotine which is a very addictive chemical. Using nicotine can harm brain development in young people and it can also lead to addiction. Young people who use e-cigarettes are more likely to use regular cigarettes. JUUL comes in flavors like mint, mango, and crème brulee. These types of flavors can appeal to young people and may make them more interested in trying e-cigarettes or tobacco products. What can parents do to help prevent JUUL or e-cigarette use? Learn more about the different types of e-cigarettes and what they can look like. Talk with your children about the risks of using JUUL and other e-cigarettes. Use this helpful tip sheet to get you started on talking with your children about e-cigarettes. Be a positive role model for your children by being tobacco-free. Truth Initiative – Get the latest information and news about e-cigarettes from the Truth Initiative, America’s largest non-profit public health organization dedicated to tobacco prevention. Centers for Disease Control and Prevention (CDC) – Information and resources about e-cigarettes from the CDC. JUUL E-Cigarettes: A New Threat to Kids – Information, fact sheets, and resources from the Campaign for Tobacco-Free Kids organization. For help on quitting smoking, call 1-866-new-lung (1-866-639-5864).